Department of Pharmaceutics 1, KCT College of Pharmacy, Gulbarga - 585104, Karnataka, India. Department of Pharmaceutics 3, Oxford College of Pharmacy, Bengaluru - 560068, Karnataka, India. ABSTRACT: Objective: The objective of the current investigation is to study the combined influence of sodium alginate, uriddall mucilage and calcium chloride on drug encapsulation efficiency and particle size of microspheres. Zidovudine-loaded sodium alginate based uriddall mucilage microspheres were prepared by the solvent evaporation method. Further, optimization of the formulation was done using a three-factor, three levels of Box-Behnken design (BBD). Microspheres were subjected to surface morphology and in-vitro dissolution studies. Sodium alginate alone or in combination with uriddall mucilage and calcium chloride has a substantial influence on encapsulation efficiency and particle size of microspheres. Optimized formulation was obtained using desirability approach of numerical optimization. The experimental values of drug encapsulation efficiency and particle size for the optimized formulation were found to be 83.12 ± 1.38%, and 846.56 ± 2.56 μm respectively, which were in close agreement with those predicted by the mathematical models. The drug release was also found to be slow and extended for more than 12 h, and release rates were fitted to the Power law equation and Korsmeyer-Peppas model to compute the diffusion parameters. 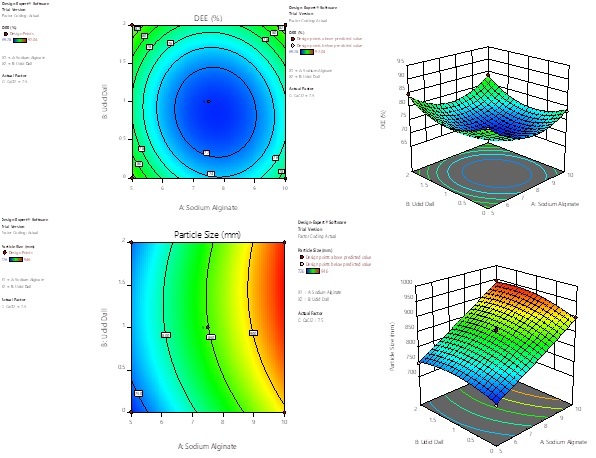 The Box-Behnken design demonstrated the role of the derived equation and contour plots in predicting the values of dependent variables for the preparation and optimization of zidovudine loaded sodium alginate based udiddall mucilage microsphere. INTRODUCTION: The mucoadhesive polymer containing oral drug delivery systems can prolong the residence time of drugs at the absorption site and facilitate intimate contact with the underlying absorptive surface to enhance bioavailability 1. Polymers used in the mucoadhesive formulations include natural, semi-synthetic and synthetic ones. In recent years, a growing interest has been identified in the development of natural polymer-based drug delivery systems due to their biodegradability, biocompatibility, aqueous solubility, swelling ability, easy availability, and cost-effectiveness 2. Amongst various natural polymers, alginates have been widely used in the development of drug delivery applications 3-6. Sodium alginate (SA) undergoes ionotropic-gelation by Ca2+ to form calcium alginate due to ionic interaction. Sodium alginate has mucoadhesive property; however, the cross-linked alginates are usually fragile 7, 8. Therefore, the blending of different mucoadhesive polymers is one of the most popular approaches to formulate ionotropically cross-linked alginate-based mucoadhesive spheres 7, 9, 10. Again, blending with suitable polymers, may improve the drug encapsulation, which is found comparatively lower in alginate-based beads prepared by ionotropic gelation method 6. In recent years, plant mucilages have evoked tremendous interest due to their diverse applications in pharmacy, for the formulation of both solid and liquid dosage forms 11. Mucilages are pharmaceutically important polysaccharides with a wide range of applications such as thickening, binding, disintegrating, suspending, gelling, emulsifying, stabilizing agents and also as release retardants 12. With the increase in demand for natural mucilages, it has become necessary to isolate and evaluate the newer sources of mucilages to meet the needs. The seeds of Vigna mungo swell and form a gelatinous mass when it comes in contact with water due to its hydrophilic nature 13. Vigna mungo also referred to as the urd bean, urid, black gram, black lentil or white lentil is a bean grown in southern Asia. It is food legume and belongs to family Leguminosae 14. Zidovudine hydrochloride is a class of nucleoside reverse transcriptase inhibitor, has been used for successive treatment for HIV/AIDS infection. It works by selectively inhibiting the viral reverse transcriptase, an enzyme, so that the viral replication process inhibited and leads to patient clinical and immunological responses 15, 16. Zidovudine is classified under the Biopharmaceutical Classification System (BCS) as a class III drug, has a short biological half-life, and undergoes extensive first-pass metabolism. Due to first pass metabolism average bioavailability is approximately 63%. More than 75% of the administered dose of Zidovudine is metabolized by the liver through glucuronidation which is inactive and the remaining 20% is excreted unchanged in urine 17, 18. Long term therapy of zidovudine can have severe side effects such as bone marrow toxicity resulting in granulocytopenia and anemia 19. These side effects are dose-dependent. The toxicity can be reduced by reducing the dose and minimizing the plasma level fluctuation 20, 21. Therefore, it would be beneficial to develop a mucoadhesive microspheres of zidovudine using sodium alginate based uriddall mucilage for oral use, which might facilitate an intimate contact with the mucous membranes (i.e., mucoadhesion or bioadhesion) in the gastrointestinal tract, and thus the residence could be prolonged to release zidovudine at a controlled rate over an extended period to maximize the therapeutic effect. In the development of any pharmaceutical formulation, an important issue is to design a formulation with optimized quality in a short period and a minimum number of trials 22, 23. Traditionally, pharmaceutical formulators develop various formulations by changing one variable at a time while keeping others fixed. This classical method is laborious and time-consuming. However, many experiments do not succeed their purpose because they are not properly thought outland designed, and even the best data analysis cannot compensate lack of planning. Therefore, it is essential to understand the influence of formulation variables on the quality of formulations with a minimal number of experimental trials and subsequent selection of formulation variables to develop optimized formulation using established statistical tools 24-26. Factorial designs, where all the factors are studied in all possible combinations, are considered the most efficient in estimating the influence of individual variables and their interactions performing minimum numbers of experiments 27. A computer-aided optimization technique based on 32 (three factors and three levels) factorial design and response surface methodology was employed to investigate the effects of three independent process variables (factors), sodium alginate, uriddall mucilage and calcium chloride concentration on the properties of zidovudine loaded ionotropically gelled uriddall-alginate microspheres such as drug encapsulation efficiency and particle size of microsphere. Materials: Zidovudine gift sample was obtained from Hetero Drugs Pvt. Ltd., Hyderabad. Sodium alginate and Calcium chloride were purchased from Loba chem Pvt. Ltd., Mumbai. Uriddall purchased from local market. All other ingredients and reagents used were of analytical grade. Statistical Experimental Design: The traditional method is a time wasting process because during the formulation it is essential to alter one factor at a time 28, 29. The traditional method fails to study the interactions effects among the factors if more than one factor can affect the final formulation properties 28. Therefore, by using a statistical approach, a three-factor, three-level Box-Behnken design (BBD) Design-Expert®11 trial version software, Stat-Ease Inc., Minneapolis, (USA) was applied for the optimization of uriddall mucilage containing zidovudine loaded sodium alginate microspheres. This Box-Behnken design is suitable for investigating the quadratic response surfaces and also helps to accumulate a second order polynomial equation. This design assists us in getting an optimal formulation with execution the least number of trial runs 30. The design comprised of simulated center points and other points lying at the midpoints of each edge of the multidimensional cube which will describe the section of attention for assessing the main effects, interactions effects and quadratic effects of the formulation factors31. The dependent response variable (Y) of the non-linear quadratic model was clarified via the resulting equation32. Y = b0+ b1X1 + b2X2 + b3X3 + b12X1X2 +b23X2X3 + b13X1X3 + b11X12+ b22X22+b33X32……. Where; Y is the dependent response variable related to each factor level combination, b0 an intercept and b1-b33 is the regression coefficients values. X1, X2, and X3 are the main selected factors, X1X2, X2X3, and X1X3 are the interaction effects and X12, X22 and X32 are the quadratic expressions. The concentration of sodium alginate uriddall mucilage and calcium chloride was selected as independent factors X1, X2, and X3 respectively. In this design, each independent process variables (factors) has three levels such as high level (+1), medium level (0) and low level (-1) Table 1. The seventeen experimental runs were generated by Box-Behnken design and further proceed to generate contour plot, 3-D plots, and then optimization of the microspheres was done. Each of the experimental run being conducted three times. Preparation of Zidovudine-loaded Microsphere: Various formulations of zidovudine drug loaded microsphere were prepared by utilizing Box-Behnken design employing ionic gelation method using mucoadhesive polymer sodium alginate anion and uriddall mucilage in the combination of Ca2+ as cationic components. Mucoadhesive polymer sodium alginate and mucoadhesive mucilage uriddall were dissolved in purified water (10 ml) separately. Then both the solutions were mixed to form a homogeneous polymer solution. The drug was added to the polymer solution and mixed thoroughly with the help of pestle and mortar to form viscous dispersion. The resulting dispersion was added dropwise into calcium chloride solution (100 ml) through a syringe with needle (size no. 21) with continuous stirring at 500 rpm. The added droplets were retained in the calcium chloride solution for 15 min to produce spherical rigid microspheres. The microspheres were collected by decantation, and the product thus separated was washed repeatedly with water and dried at 45 ºC for 12 h and stored in desiccators. Determination of Drug Encapsulation Efficiency and Particle Size Analysis: 100 mg of mucoadhesive microspheres were accurately weighed. They were powdered and extracted with 100 ml of methanol. Further, it was serially diluted with phosphate buffer pH 7.4. The resulting solution was analyzed for zidovudine drug content by measuring absorbance in a UV-spectro-photometer at 266 nm using phosphate buffer pH 7.4 as blank. The studies were carried out in triplicate. Encapsulation efficiency (%) was calculated using the formula. Particle size and size distribution of zidovudine mucoadhesive microspheres were measured by sieve analysis using mechanical sieve shaker. Different sizes in a batch are separated by sieving using a range of standard sieves 10/22, 22/44 and the amounts retained on different sieves were weighed. Studies were carried out in triplicate. The average sizes of the microspheres were calculated by using the equation. Where; Xi- Mean size range; fi- Percentage material retained on the smaller sieve size range. In-vitro Dissolution Studies: In-vitro dissolution study was carried out using USP I type apparatus and 900ml of phosphate buffer 7.4 used as dissolution medium. Mucoadhesive microspheres equivalent to 50 mg of zidovudine filled in hard gelatin capsules were used for the study. Capsules were rotated at 50 rpm, and a temperature of 37 ± 0.5oC was maintained throughout the experiment. At fixed intervals viz., 0.25, 0.5, 1, 1.5, 2, 3, 4, 5, 6, 8, 10 and 12 h, aliquots (5 ml) was withdrawn and replaced with fresh dissolution media to maintain the sink condition. The concentration of drug released at different time intervals was then determined by measuring the absorbance at 266 nm against blank. The studies were carried out in triplicate. The in-vitro dissolution data of mucoadhesive microspheres were tabulated and computed by using dissolution software viz., PCP DISSO V3.0. External Surface Morphological Study: External surface morphology of drug zidovudine loaded microsphere was observed using Model JSM-840 A, Joel, Japan. The particle size, shape and surface morphology of optimized mucoadhesive microspheres were examined. Mucoadhesive microspheres were fixed on aluminum stubs and coated with gold using a sputter coater SC 502, under vacuum [0.1 mm Hg] and were analyzed. Preparation of Zidovudine Mucoadhesive Microspheres: Zidovudine mucoadhesive micro-spheres were conveniently prepared using different core: coat ratios, using mucoadhesive polymer sodium alginate, and mucilage isolated from uriddall by conventional orifice ionic gelation method using calcium chloride as the cross-linking agent. Data Analysis, Model Validation, and Optimization: Present experimental data and information obtained through the design expert software provide us the opportunity to describe the influence of different parameters on the performance of formulation. The values for drug encapsulation efficiency (Y1) and particle size (Y2) were determined by experimentally and analyzed using the Design-Expert®11 trial version software, drug encapsulation efficiency and particle size were selected as the dependent variables. The equations by a second-order polynomial model are shown as follow. Mathematical models, Contour plot and 3-D surface graphs were generated for each response. The above equations in terms of coded factors (equations 1 and 2) can be used to make predictions about the response for given levels of each factor. Drug encapsulation efficiency (DEE) of mucoadhesive microspheres were ranged from 69.28-92.04% Table 2. ANOVA for encapsulation efficiency Table 3 showed that X1, X2, X3, X12, X22, and X32 are significant model terms. The Model-F value of 152.59 implies the model is significant. There is only a 0.01% chance that F-value this large could occur due to noise. These model F-value and lack of fit value confirms the reliability of this model. The Predicted R² of 0.9543 is in reasonable agreement with the Adjusted R² of 0.9884; i.e., the difference is less than 0.2. Adequate Precision measures are the signal to noise ratio. For the quadratic model of drug encapsulation efficiency, a ratio greater than 4 is desirable. Adequate Precision of 35.11 for drug encapsulation efficiency indicates an adequate signal. Mucoadhesive Polymer (Sodium Alginate) alone or combination with uriddall mucilage and calcium chloride has a significant effect on encapsulation efficiency of microspheres. In the presence of calcium chloride, comparatively higher microsphere encapsulation was obtained. Particle sizes of mucoadhesive microspheres ranged from 726-946 μm Table 2. ANOVA for particle size showed that X1, X2, X3, X2X3, X22, and X32 were significant model terms Table 4. Model F-value for particle size was found 85.635 showing the significance of this model since there was only a 0.01% chance that this F-value large due to noise. These model F-value and lack of fit value confirm the reliability of this model. The “Predicted R2” of 0.9253 is in reasonable agreement with the “Adjusted R2” of 0.9797; i.e., the difference is less than 0.2. Adequate Precision measures the signal to noise ratio. For quadratic model of particle size a ratio greater than 4 is desirable. Adequate Precision of 29.58 for particle sizes indicates an adequate signal. Mucoadhesive Polymer (Sodium Alginate) alone or combination with uriddall mucilage and calcium chloride has a significant effect on particle size of microspheres. In the presence of sodium alginate, comparatively larger microsphere particles were obtained. Contour plots and three-dimensional response surface plots Fig. 1 which exhibits the effects of the concentration of sodium alginate (X1), udiddall mucilage (X2) and calcium chloride on encapsulation efficiency (Y1; %) and particle size (Y2; μm). Linear correlation plots between the actual, the predicted response variables are presented in Fig. 2 and 3, and their corresponding residual plots are showing the scatter of the residuals versus predicted values are presented in Fig. 4 and 5. The optimum formulation was found out with the numerical optimization technique using the desirability function methodology 33. The criterion of choosing optimum formulation was based on minimum microsphere size and maximum drug encapsulation efficiency within the range of 75-95%. Table 5 shows the observed and predicted response values for the optimized microspheres. The optimized mucoadhesive zidovudine micro-spheres showed the encapsulation efficiency 83.12 ± 4.38% and particle size of 846.56 ± 4.81 µm. The surface morphological analysis of zidovudine loaded uriddall mucilage microspheres was visualized by SEM. The SEM photograph of these microspheres possessed irregular shape without forming agglomeration. Their surface morphologies appeared to have rough with characteristic large wrinkles and cracks, as it was evident from the SEM photographs. These cracks and wrinkles might be caused by partially collapsing the polymeric gel network during drying. The in-vitro zidovudine release studies were carried out for zidovudine mucoadhesive microspheres in the phosphate buffer (pH, 7.4) for 12 h. All these microspheres showed prolonged zidovudine release over 12 h. Zidovudine release from these uriddall mucilage microspheres release was controlled and prolonged in phosphate buffer (pH, 7.4), due to the higher swelling rate of these microspheres in phosphate buffer. In the entire formulations, Korsemeyer-Peppas model was found to be the best-fitted model. The release of the drug follows non‑fickian release with n value varying from 0.5095 to 0.7685 (greater than 0.45) indicating drug release was swelling followed by erosion of polymeric blend (uriddall mucilage); this could be attributed due to polymer dissolution and polymeric chain enlargement or relaxation. Both the factors viz., the concentration of sodium alginate and uriddall mucilage has shown negative effect on drug release. As the concentration of polymer has increased the release of drug decreased, whereas the increase in concentration of cacl2 increases the drug release. The dissolution data were subjected to mathematical treatment using PCP Disso Ver. 3 software. In-vitro release kinetics data to different mathematical models for optimized zidovudine microspheres are shown in Table 6. CONCLUSION: The Box-Behnken design along with the desirability function approach was effectively used to optimize the process variables of zidovudine loaded uriddall mucilage microspheres. The investigational values of the responses prepared under the optimum conditions were found close to the expected values. The optimal conditions of sodium alginate concentration were 9.269% w/v, uriddall mucilage concentration was 0.081% w/v and calcium chloride concentration was 5.29% w/v. The optimized microspheres showed drug encapsulation efficiency 83.12 ± 4.38% and particle size of 846.5 ± 4.81 μm. The microspheres were spherical in appearance and no microspheres were found to be elongated. Therefore, it can be concluded that three-factor, three-level Box-Behnken design can be used for the optimization of zidovudine loaded sodium alginate based uriddall mucilage microspheres with the minimum number of experimental runs which not only save the cost of the optimized formulation it also saved the time. ACKNOWLEDGEMENT: The authors are thankful to Hetero Drugs Pvt. Ltd., Hyderabad, India for providing gift sample of zidovudine and principal, management, teaching and non teaching staff of KCT College of Pharmacy, Gulbarga for encouragement and support in carrying out this research work. CONFLICT OF INTEREST: Authors declare that there is no conflict of interest in this research work. Vidyadhara S, Sasidhar RL, Balakrishna T, Balaji B and Amrutha R: Formulation and evaluation of controlled release floating micro-balloons of stavudine. Scientia Pharmaceutica 2015; 83: 671-682. Santosh GG, Anandkumar Y and Mallikarjuna SC: Preparation and evaluation of zidovudine mucoadhesive microspheres. European Journal of Pharmaceutical and Medical Research 2017; 4(9): 570-576. Freitas EDD, Rosa PCP, Silva MGCD and Vieira MGA: Development of sericin/alginate beads of ketoprofen using experimental design: Formulation and in-vitro dissolution evaluation. Powder Technology 2018; 335: 315-326. Santosh G and Anandkumar Y: Formulation and evaluation of glipizide mucoadhesive microspheres. International Journal of Pharma Research and Health Sciences 2016; 4 (6): 1483-1488. Shahira F, Menshawe EL, Kharshoum RM, Hamad DS and Halawa A: Effect of biodegradable copolymers and divalent cations on the sustained release ability of propranolol hydrochloride loaded biomaterial microspheres. International Journal of Pharma and Pharmaceutical Sciences 2016; 8(5): 311-317. Nayak AK, Khatua S, Hasnain MS and Sen KK: Development of alginate-PVP K30 microbeads for controlled diclofenac sodium delivery using central composite design. DARU Journal of Pharmaceutical Sciences 2011; 19(5): 356-366. Pal D and Nayak AK: Development, optimization and antidiabetic activity of gliclazide-loaded alginate-methyl cellulose mucoadhesive microcapsules. AAPS Pharm SciTech 2011; 12(4): 1431-1441. Lianes F, Ryan DH and Marchessault RH: Magnetic nanostructured composites using alginates of different M/G ratios as a polymeric International Journal of Biological Macromolecules 2000; 27(1): 35-40. Pal D and Nayak AK: Novel tamarind seed polysaccharide alginate mucoadhesive microspheres for oral gliclazide delivery: in vitro-in vivo evaluation. Drug Delivery 2012; 19(3): 123-131. Prajapati SK, Tripathi P, Ubaidulla U and Anand V: Design and development of gliclazide mucoadhesive microcapsules: in-vitro and in-vivo evaluation. AAPS Pharm Sci Tech 2008; 9(1): 224-230. Chourasia A and Agrawal S: Development and evaluation of ciprofloxacin hydrochloride loaded ocular insert by using “plantago ovata” as a natural polymer. International Journal of Current Pharmaceutical Research 2018; 10(4): 79-88. Nayak AK, Pal D, Pany DR and Mohanty B: Evaluation of Spinacia oleracea leaves mucilage as an innovative suspending agent. Journal of Advanced Pharmaceutical Technology and Research 2010; 1(3): 338-341. Yadav IK, Jaiswal D, Singh HP, Chandra D and Jain DA: Anti- Hiv drugs from natural sources. The Pharma Research 2009; 1: 1281-1283. Barik SS and Padhy R: Morphological analysis of black gram Vigna mungo (L.) with zinc stress. The Pharma Innovation Journal 2018; 7(7): 465-469. Mohima T, Dewan IS, Islam MA, Rana S and Hossain A: Encapsulation of zidovudine in different cellulosic acrylic and methacrylic polymers loaded microspheres: in-vitro characterization and compatibility studies. 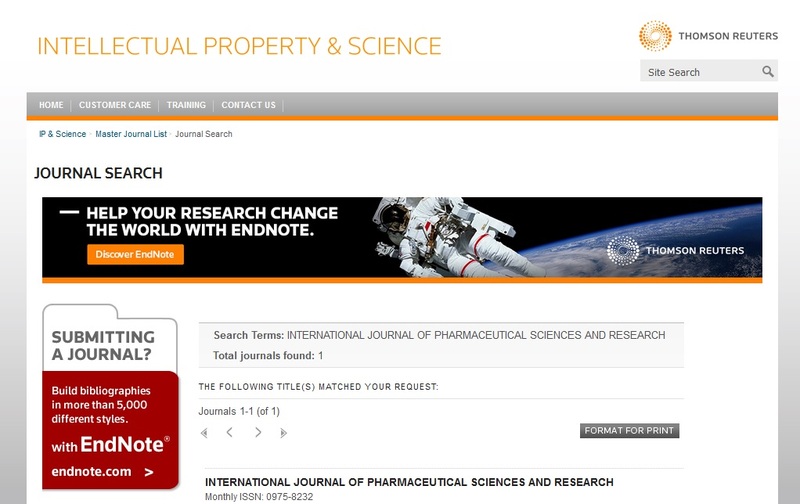 International Journal of Pharmacy and Pharmaceutical Sciences 2016; 7(1): 487-495. Novakovaa L, Pavlika J, Chrenkovaa L, Martinec O and Cerveny L: Current antiviral drugs and their analysis in biological materials - Part II: Antivirals against hepatitis and HIV viruses. Journal of Pharmaceutical and Biomedical Analysis 2018; 147: 378-399. Joshy KS, Susan MA, Snigdha S, Laly AP and Sabu T: Encapsulation of zidovudine in PF-68 coated alginate Conjugate nanoparticles for anti-HIV drug delivery. International Journal of Biological Macromolecules 2018; 107: 929-937. Kohli S, Pal A and Jain S: Preparation, characterization and evaluation of poly (lactide-co-glycolide) microspheres for the controlled release of zidovudine. International Journal of Pharmacy and Pharmaceutical Sciences 2017; 9(12): 70-77. Fischl MA, Richman DD and Hansen N: The safety and efficacy of zidovudine (azt) in the treatment of subjects with mildly symptomatic human immunodeficiency virus type 1 (HIV) infection. A double-blind, placebo-controlled trial. Annals of Internal Medicine 1990; 112(10): 727-737. Neves JD, Amiji MM, Bahia MF and Sarmento B: Nanotechnology-based systems for the treatment and prevention of HIV/AIDS. Advanced Drug Delivery Reviews 2010; 62(4-5): 458-477. Kim PS and Read SW: Nanotechnology and HIV: Potential applications for treatment and prevention. Wiley Interdisciplinary Reviews 2010; 2(6): 693-702. Lewis A, Matieu D and Phan-Tan-Lu R: Pharmaceutical Experiment Design, Marcel Dekker, New York, NY, USA, 1999. Kapil R, Nandi M and Ahuja N: Developing oral drug delivery systems using formulation by design: vital precepts, retrospect and prospects, Expert Opinion in Drug Delivery 2011; 8: 1341-1360. Singh B, Garg B, Chaturvedi SC, Arora S, Mandsaurwale R, Kapil R and Singh B: Formulation development of gastroretentive tablets of lamivudine using floating bioadhesive potential of optimized polymer blends. The Journal of Pharmacy and Pharmacology 2012; 64(5): 654-669. Singh B, Kumar R and Ahuja N: Optimizing drug delivery systems using systematic “design of experiments,” part I: fundamental aspects. Critical Reviews in Therapeutic Drug Carrier Systems 2005; 22(1): 27-105. Singh B, Dahiya M, Saharan V and Ahuja N: Optimizing drug delivery systems using systematic “design of experiments”, part II: retrospect and prospects. Critical Reviews in Therapeutic Drug Carrier System 2005; 22(3): 215-294. Ghosal K, Ghosh D and Das SK: Preparation and evaluation of naringin-loaded polycaprolactone microspheres based oral suspension using Box-Behnken design. Journal of Molecular Liquids 2018; 256: 49-57. Sharma N, Singh S, Arora S and Madan J: Quality-by-design approach for development and optimization of nefopam hydrochloride loaded poly-(ε-caprolactone) and poly-3-hydroxybutyrate microspheres. International Journal of Pharmaceutical Sciences and Research 2017; 8(12): 5111-5121. Das SK, Khanam J and Nanda A: Optimization of the preparation method for ketoprofen-loaded microspheres consisting polymeric blends using simplex lattice mixture design. Material Science Engineering 2016; 69: 598-608. Das SK, Yuvaraja SK, Khanam J and Nanda A: Formulation development and statistical optimization of ibuprofen-loaded polymethacrylate microspheres using response surface methodology. Chemical Engineering Research and Design 2015; 96: 1-14. Bhandare SB and Laddha KS: Optimization of extraction parameters for total flavonoids from gardenia gummifera gum resin by response surface methodology. International Journal of Pharmacy and Pharmaceutical Sciences 2016; 8(11): 64-68. Kharia AA and Singhai AK: Development and optimization of mucoadhesive nanoparticles of acyclovir using the design of experiments approach. 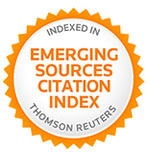 Journal of Microencapsulation 2015; 32(6): 521-532. Das SK, Yuvaraja K, Khanam J and Nanda A: Formulation development and statistical optimization of ibuprofen-loaded polymethacrylate microspheres using response surface methodology. Chemical Engineering and Research and Design 2015; 96: 1-14. Gada SG, Anandkumar Y and Setty CM: Design and optimization of zidovudine loaded uriddall mucilage microspheres, using box behnken method. Int J Pharm Sci & Res 2019; 10(4): 1856-64. doi: 10.13040/IJPSR.0975-8232.10(4).1856-64. Authors Address: Department of Pharmaceutics, KCT College of Pharmacy, Gulbarga, Karnataka, India.